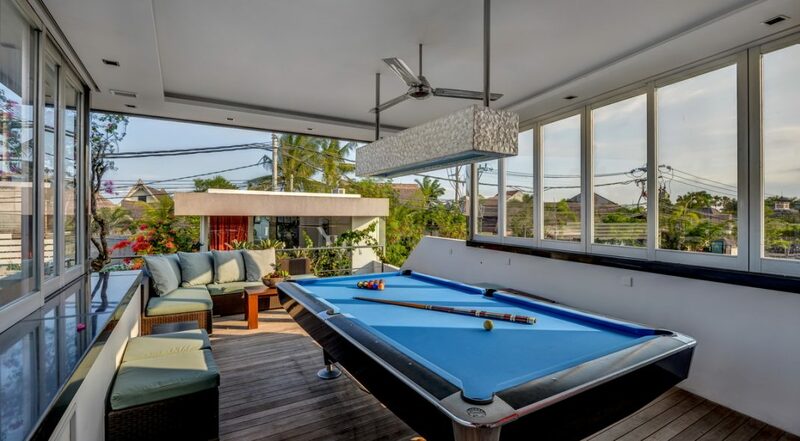 From $ 768 $ 615AUD per night We have direct contracts with most villa owners. We don't add any booking fees. We are 100% transparent with no nasty surprises. 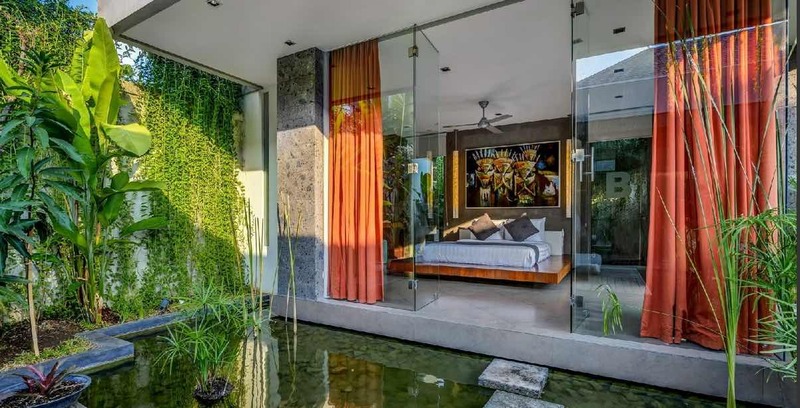 Seminyak Villas – Villa Banyu is a 4 bedroom luxury holiday villa in Seminyak featuring contemporary design & smartly incorporates water elements into its design layout. 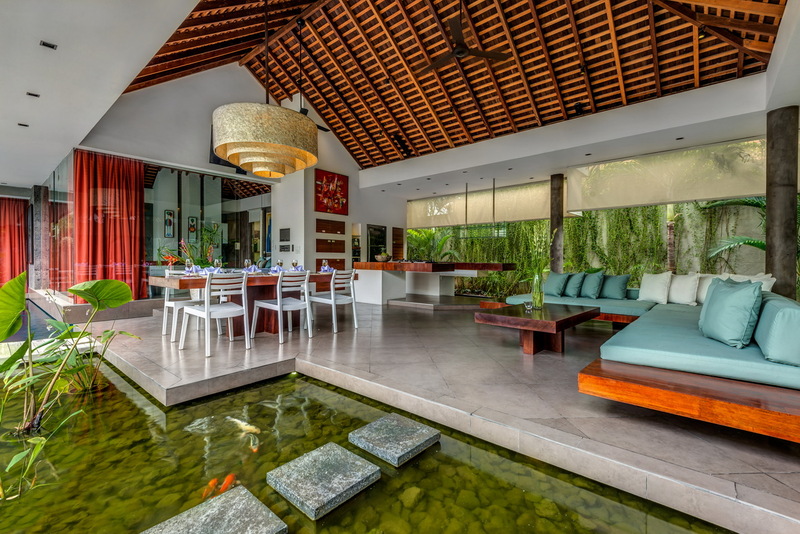 The living areas and accommodation wings are encircled by a beautiful swimming pool and calming fish ponds. 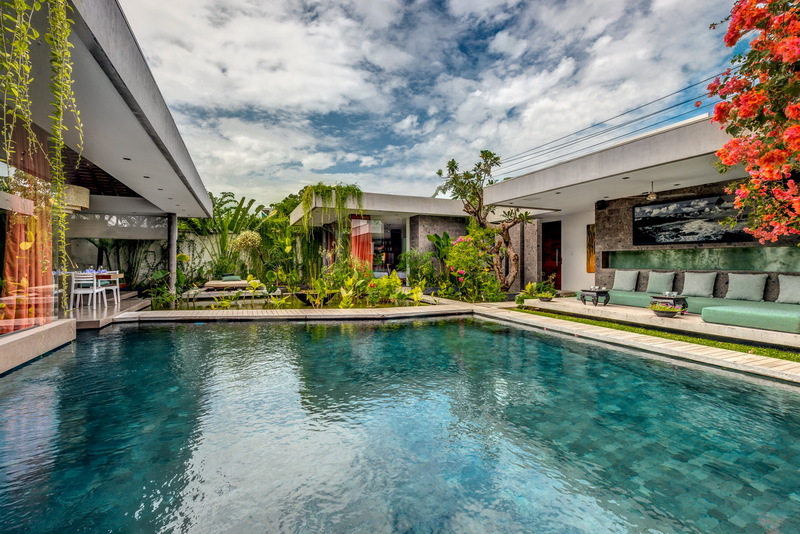 A prime Seminyak location, the villa is strategically located close to some iconic playgrounds including Ku De Ta and Potato Head Beach Clubs along with all hustle and bustle of Eat Street and the magical sunsets of Seminyak Beach. 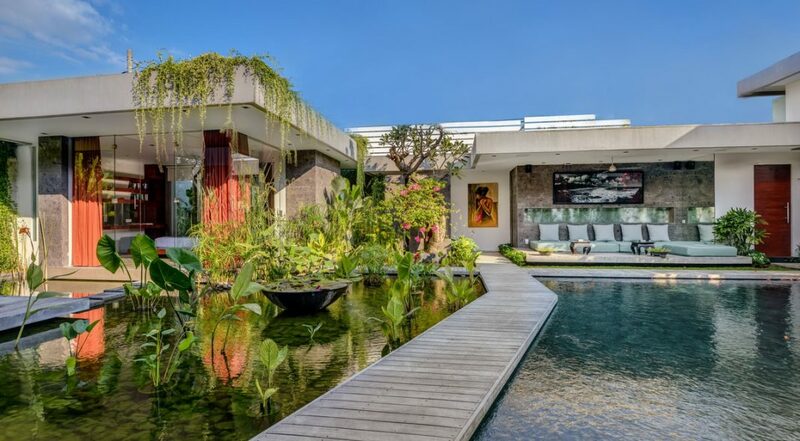 The 8 metre squared shaped swimming pool takes up a majority of the outdoor area which is bordered by timber walk ways and large koi ponds with water lilies and tropical plants. 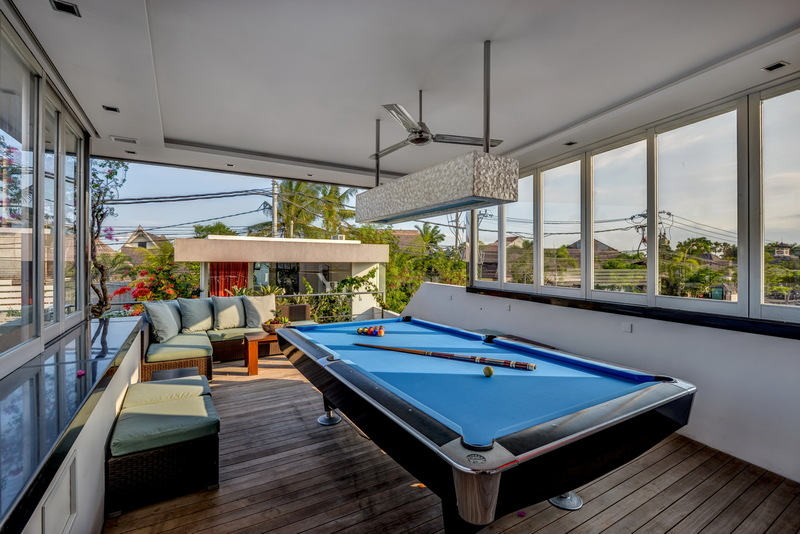 To one side of the pool is a fabulous built in lounge with cooling fans and quaint coffee tables. 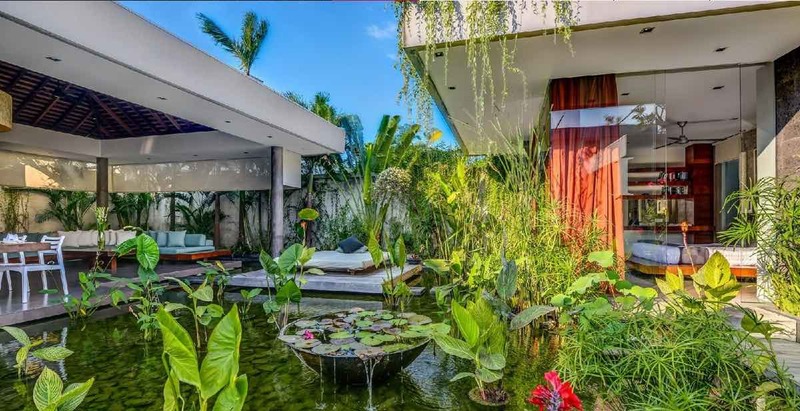 In the centre of one of the ponds waits a day bed open to the skies, a perfect place for those wanting a tropical tan. 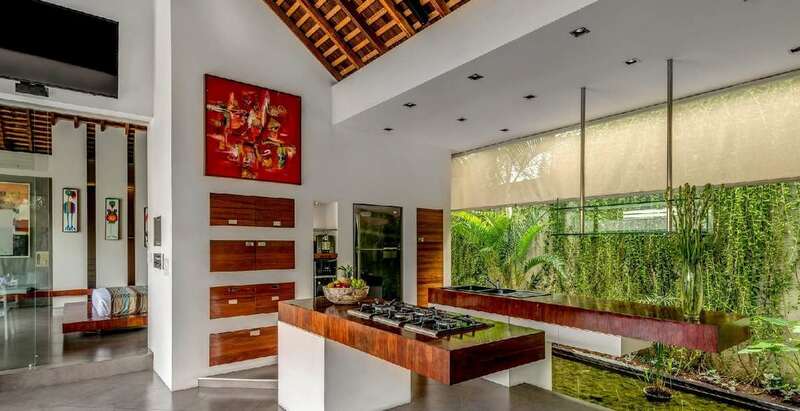 The main living area is semi-open with an open plan design incorporating a large lounge area with cushioned sofas and an adjacent dining area with a lovely dining table for 8 guests to enjoy great meals prepared by the masterful chef. 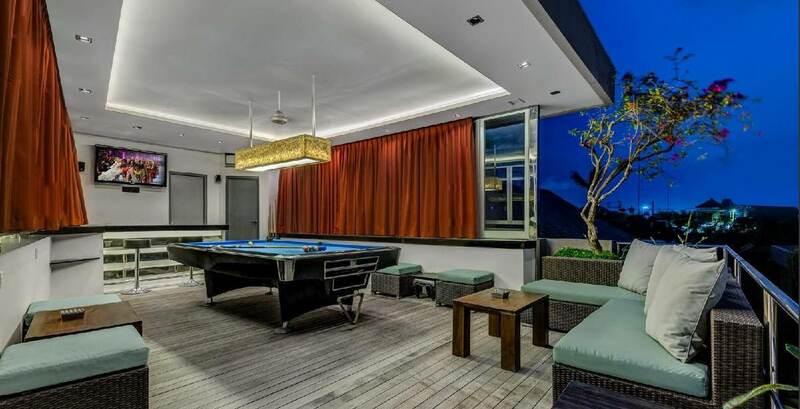 The well equipped modern kitchen has every appliance you could ask for and up a flight of stairs you will find the purpose built billiards room with a huge flat screen to watch some sport and a fully equipped bar along with a rattan outdoor setting on the balcony overlooking the pool. 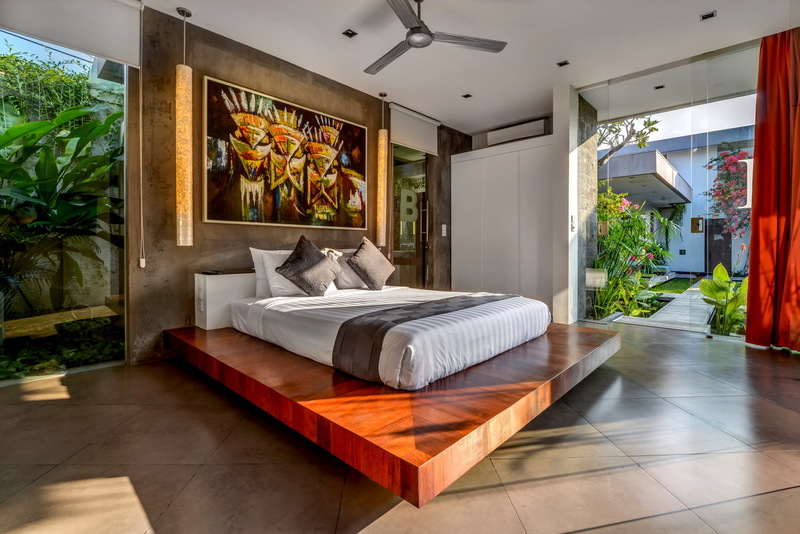 The four bedrooms are spacious, vibrant, bright and tastefully decorated with designer timber bed bases giving a futon type of feel. 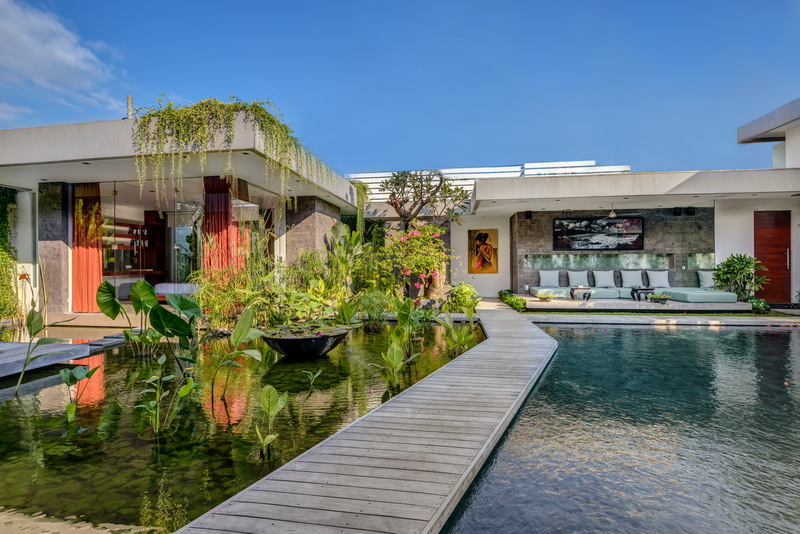 Three bedrooms are located on the ground floor with providing direct access to the pool and the third opens onto a calming koi pond. 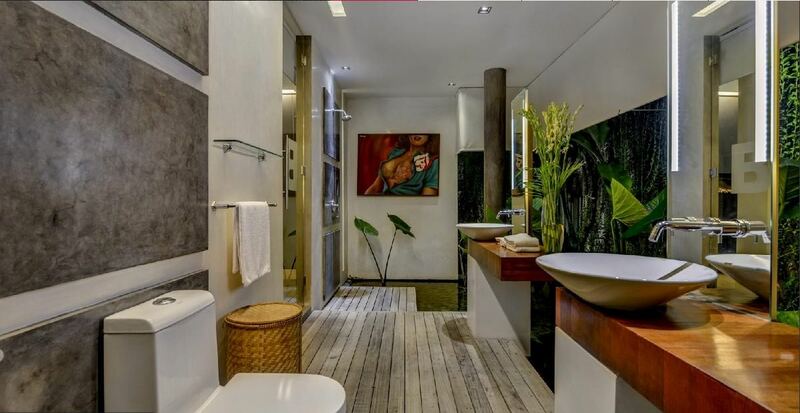 Three of the rooms have semi open-air tropical en-suite bathrooms while the fourth bedroom is located upstairs adjacent to the billiard room. 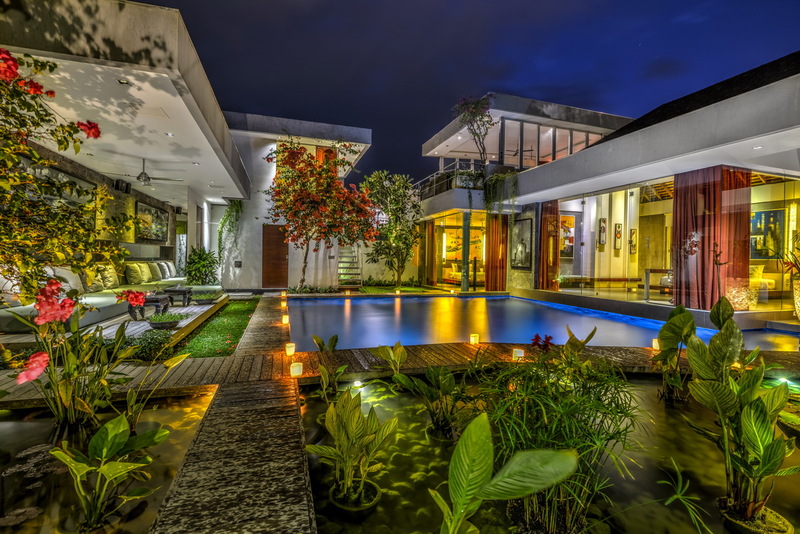 The staff at villa Banyu is long serving and very familiar with the villas operations. 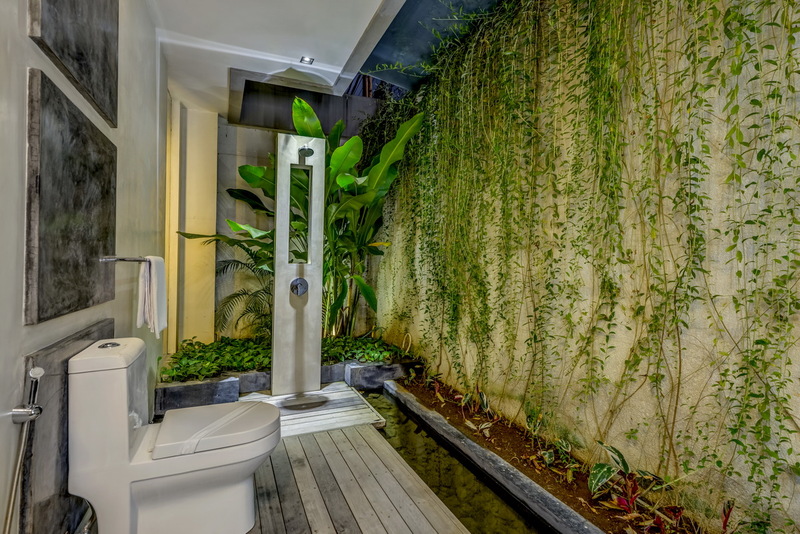 They take great pride in ensuring you have a memorable and pleasant stay and making sure everything runs smoothly. 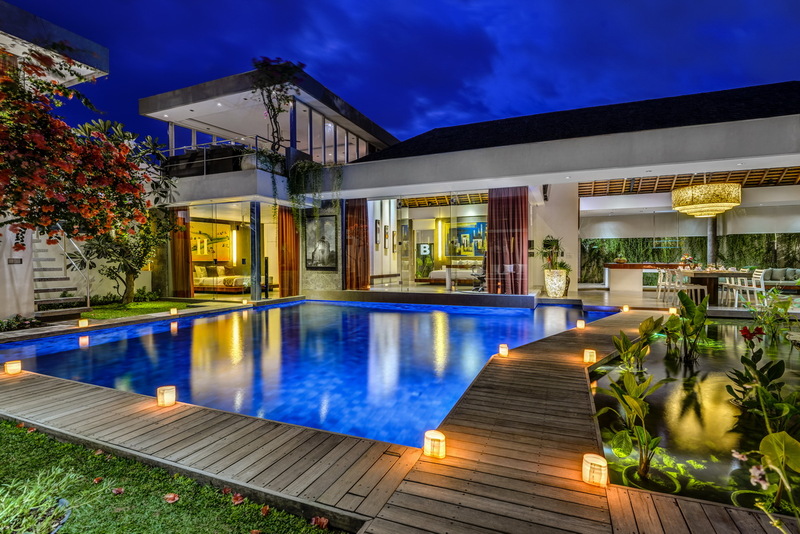 Consisting of a villa manager, butlers, housekeepers, gardeners, pool attendants and security personnel the team is ready to serve your every need. Should you require extra services such as baby sitters, masseurs, drivers and cars that can be easily arranged by the staff. 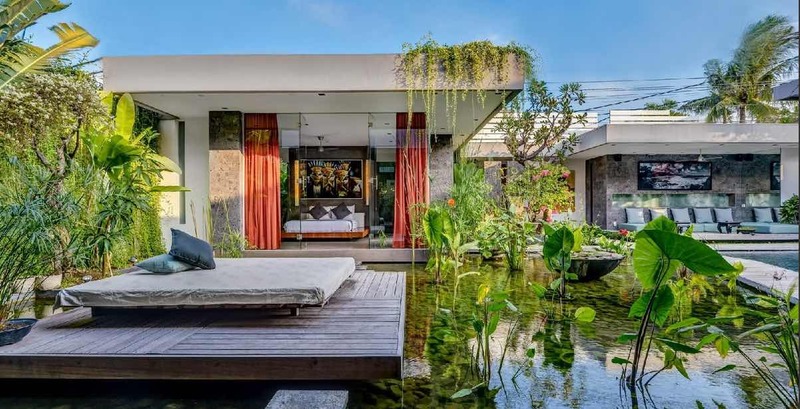 Villa Banyu is no more than a leisurely 5 min stroll from the centre of Seminyak’s famous Eat Street and its endless dining options and trendy boutiques. Sisterfields for breakfast, maybe La Lucciola for lunch and Motel Mexicola for dinner, how does that sound? 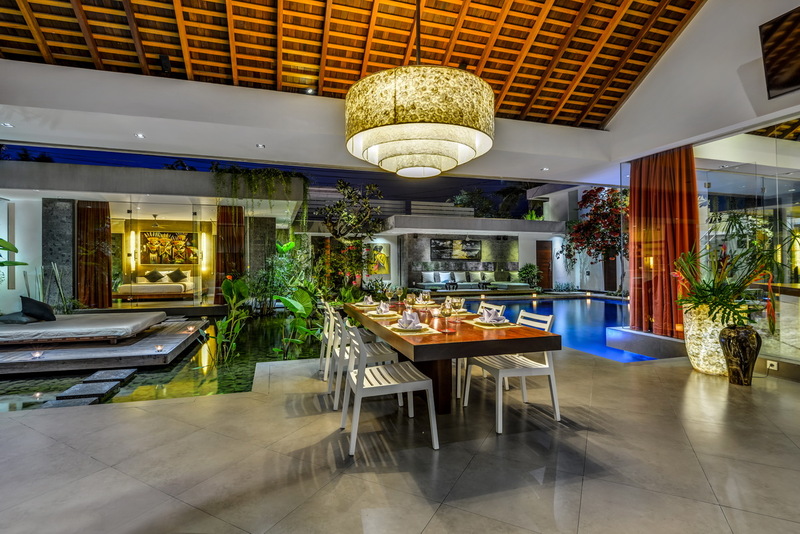 Or let’s try breakfast at Ku De Ta, sun tanning by the pool at Potato Head and a seafood banquet back at the villa? 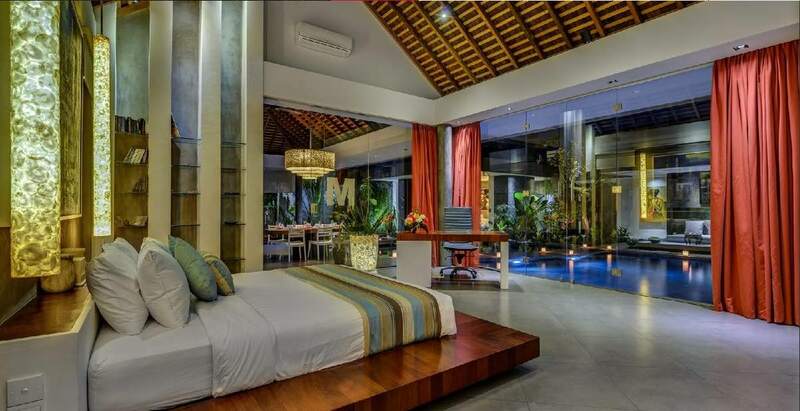 You definitely won’t get stuck for options on your holiday at Villa Banyu. 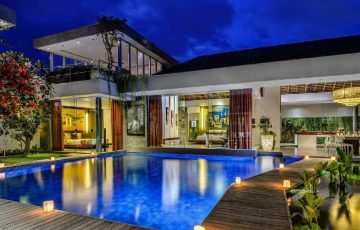 To view our full range of Seminyak villas or other Bali villas near Eat Street please browse this website or contact our reservation team. 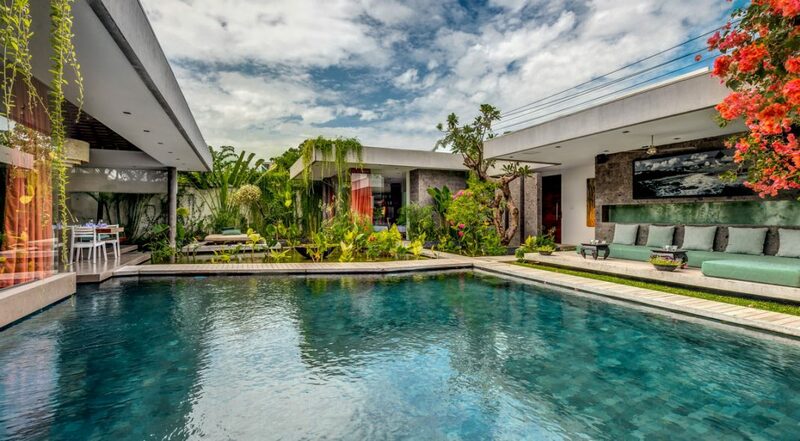 Book your Seminyak holiday at Villa Banyu well in advance as this is a popular villa, especially if your planning a trip to Bali during the Australian school or public holidays. 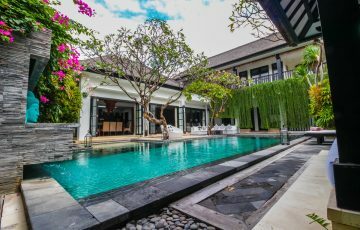 If you love being pampered during your holiday, if you want a central location, if you like to feel completely relaxed - then Villa Banyu is the ideal holiday villa. We stayed there for 8 days with our 2 children and enjoyed every minute. 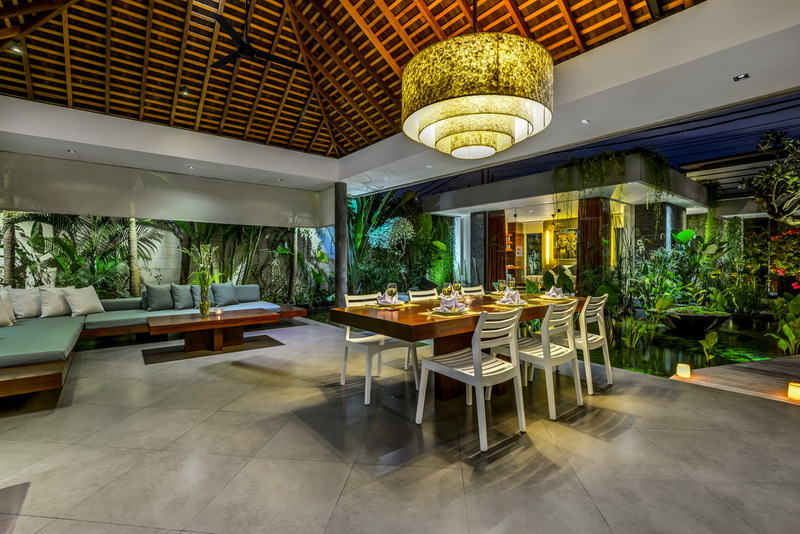 There is really not much more I can tell you about this villa except try it once in your life....you will not regret it. 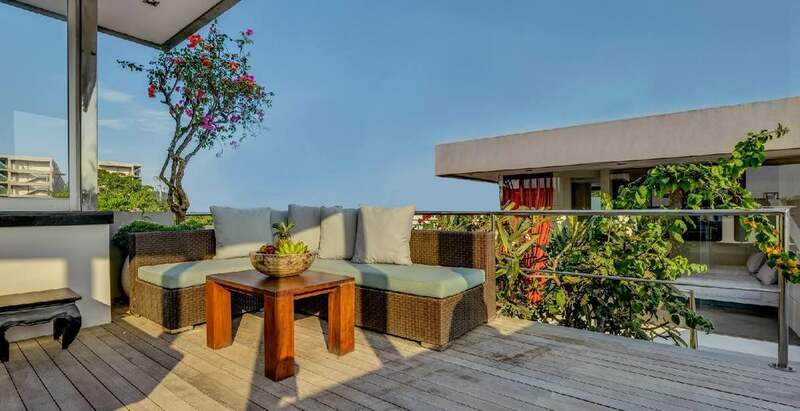 For the price and amenities nothing beats this place. 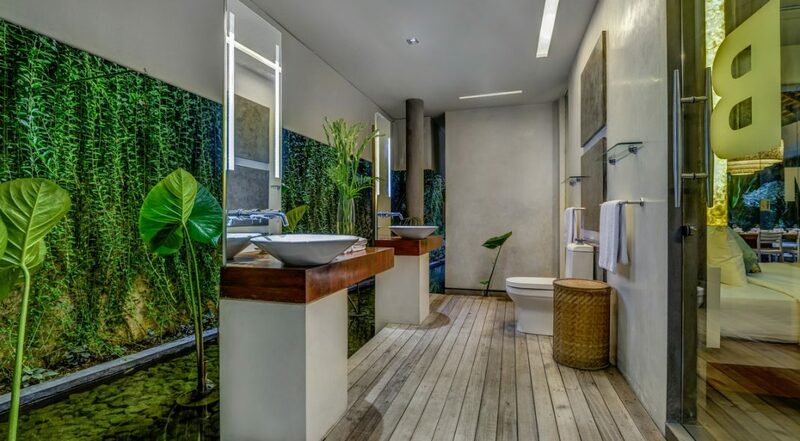 It is so stylish and sophisticated that you really have to see it for yourself. 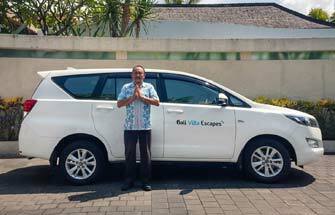 Thanks Dewi at the very helpful team at Bali Villa Escapes for all your help with booking our holiday. It was a great time and made a breeze because of your efforts. 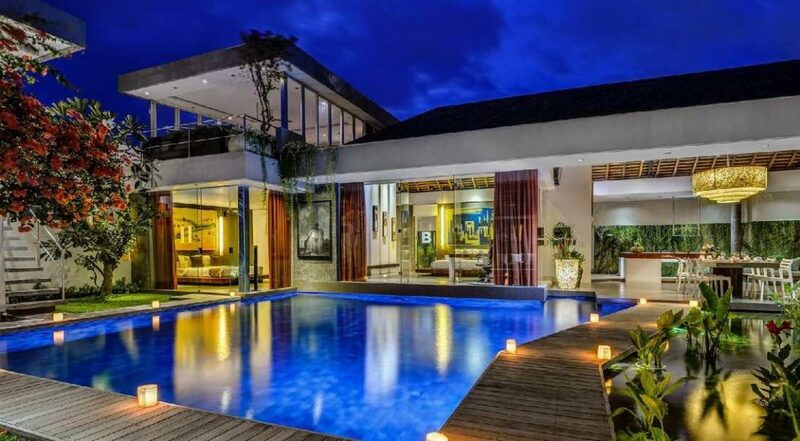 Will definitely book any future Bali holidays through you again. 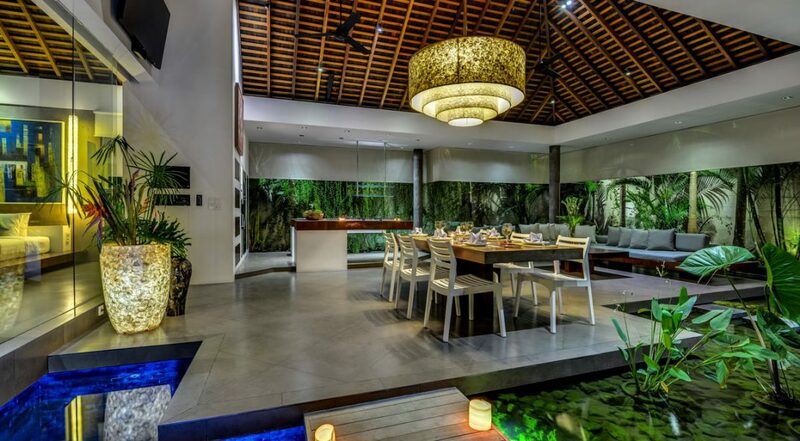 This villa was better than we expected and we loved every moment Thank you! 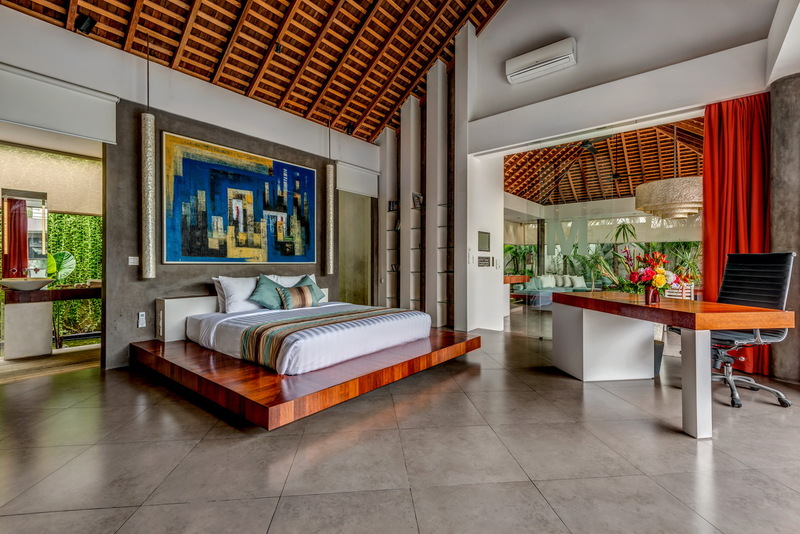 The whole family came here for a week and we loved this villa - the kids cannot stop talking about it and we still find that we end up daydreaming about being back here. 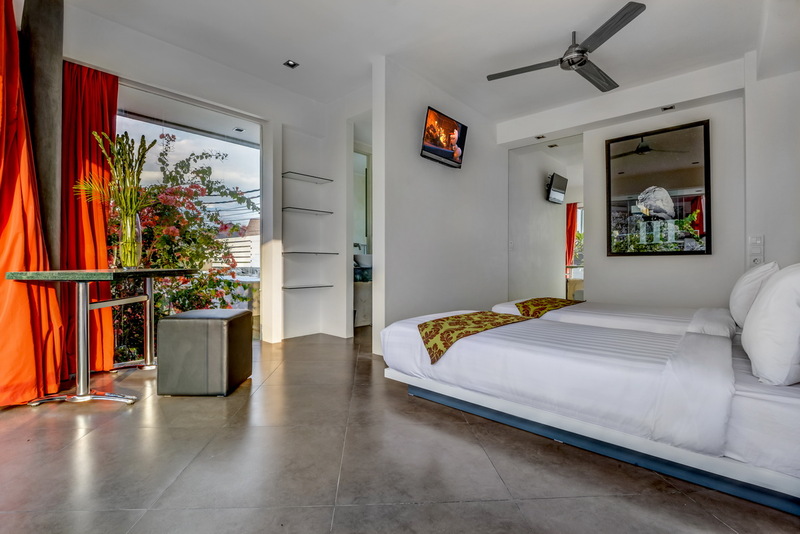 For us and the 3 kids it was a once in a life time experience and we cannot rave about Banyu enough - staff, bedrooms, the great location, bathrooms and pool were unbelievable, I cannot rate this highly enough and will certainly tell all my friends about it. 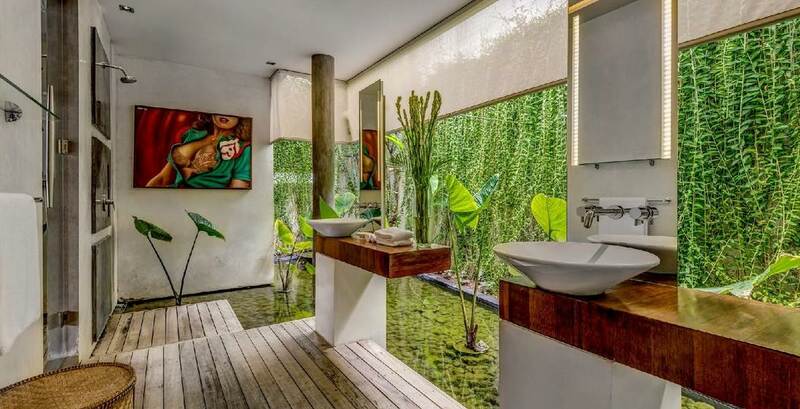 What else can we say except WOW! 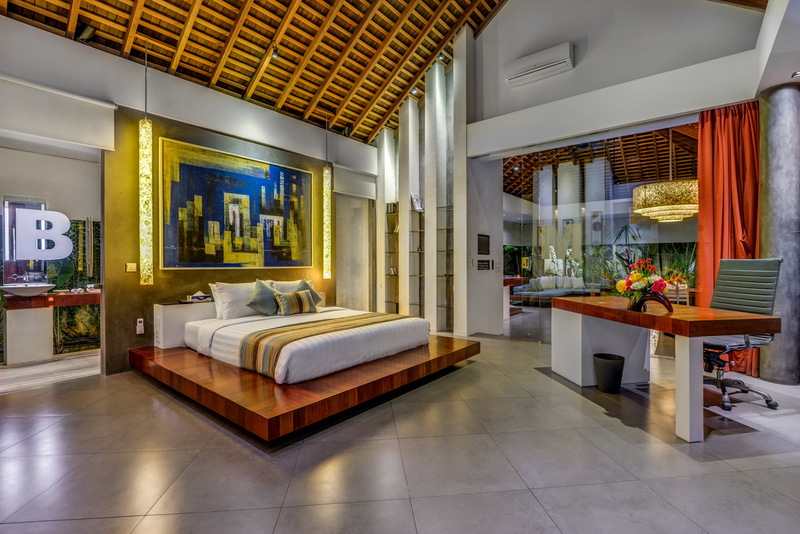 Everything was divine; pool, rooms and the level of customer service from the staff. 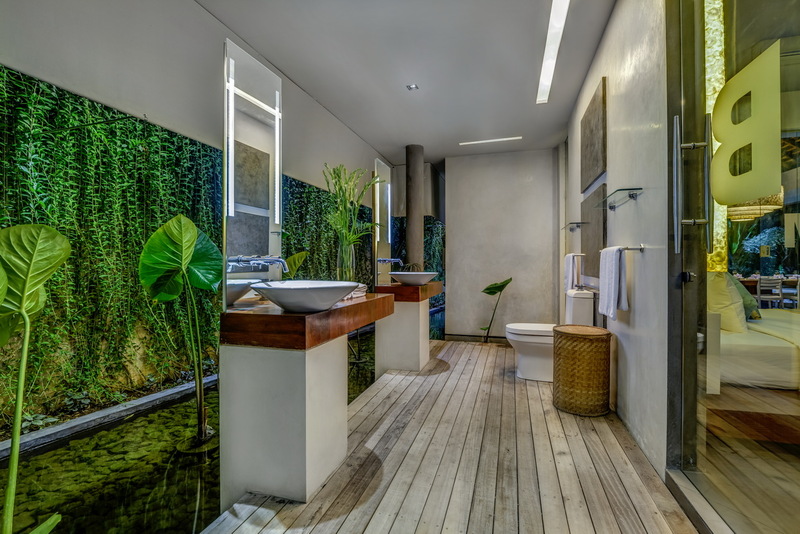 Our group stayed at Banyu for 8 days we were all pleasantly surprised as soon as we arrived. 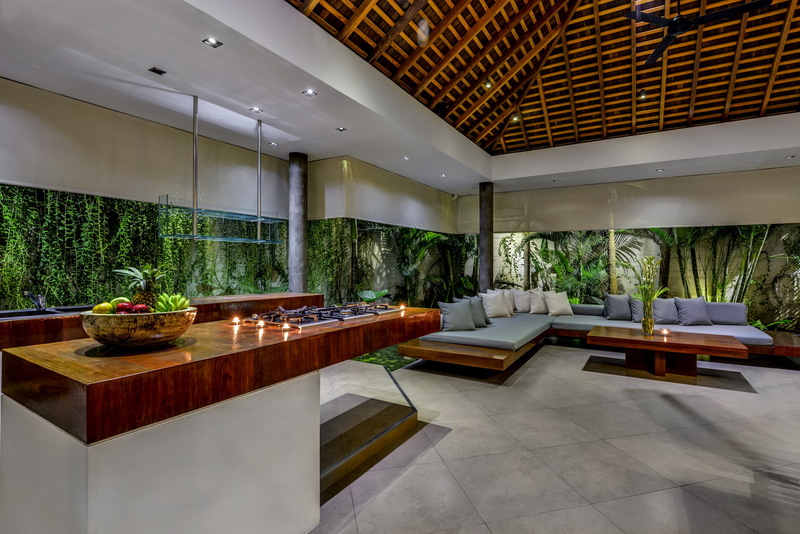 In fact the villa looked the same as the photos on the website, even better! 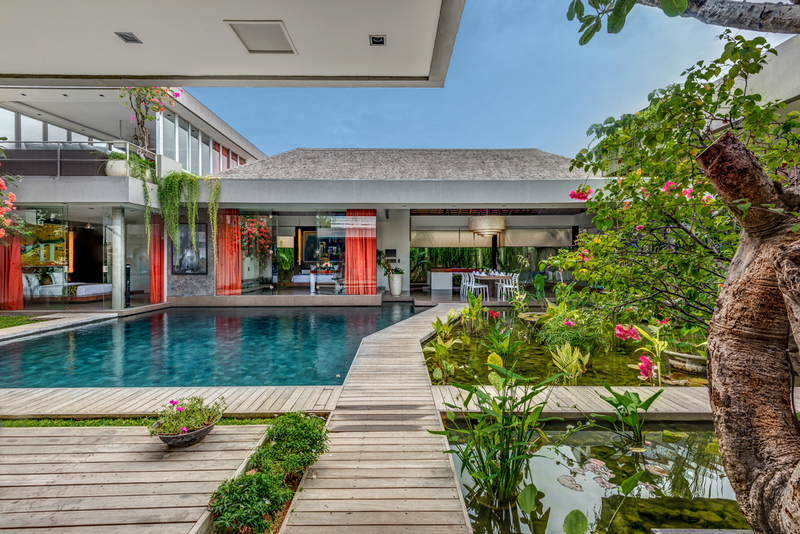 Staff made the holiday so pleasant but the location of the villa was what really blew us away. So central to everything. We were in complete heaven here. 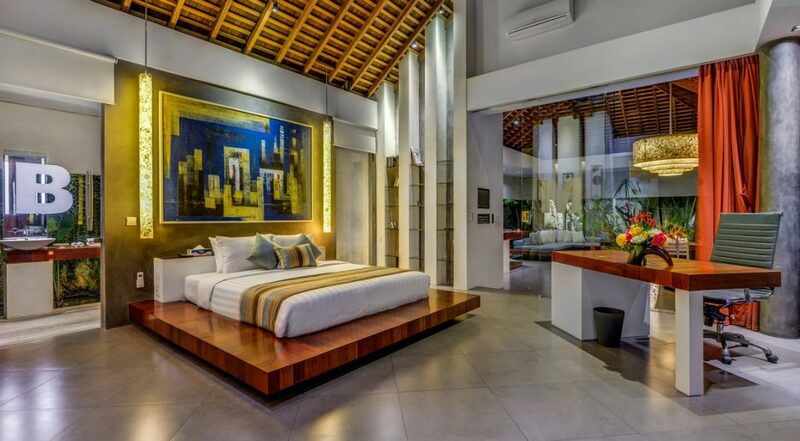 The layout of the villa was cleverly designed with spacious bedrooms and wonderful outdoor bathrooms. Staff were so friendly and we really enjoyed being with them and having them make breakfast for us. 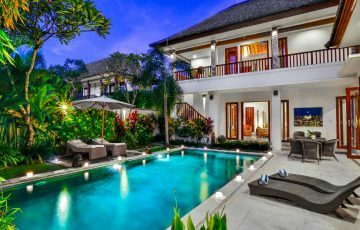 I can't recommend the villa highly enough and a huge thanks to the staff on their professional manner. We will be coming back. Just want to say hi to Putu, Kadek and the rest of the staff at Banyu, thanks for the best holiday.